(Sacramento) –At the request of Assemblywoman Cristina Garcia, the Joint Committee on Rules will now be providing free menstrual health products within the West Wing, Annex and Legislative Office Building facilities of the State Capitol and legislative offices. The request was granted following a letter Garcia sent to the committee noting that the Legislature should be a model employer and tourist destination. “Making these available upholds the purpose of a People’s House to welcome all Californians to participate in our civic life,” said Assemblymember Ken Cooley, chair of the Joint Committee on Rules. In 2017 Governor Jerry Brown signed into law Assembly Bill 10 (Garcia): menstrual products: public school restrooms. This measure received bipartisan support in both houses. The bill adds menstrual products to the list of items that must be supplied at Title 1 public schools maintaining any combination of grades 6-12. 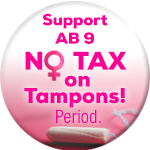 For the third time, this year Garcia has again introduced legislation, AB 31, to repeal the sales tax on menstrual health products in California. It remains the only gender specific tax in the state’s tax code. Similar legislation was vetoed in 2016 by Brown citing a General Fund loss that equated to less than 1/20th of the budget. The 58th Assembly District includes the cities of Montebello, Pico Rivera, Commerce, Bell Gardens, Downey, Norwalk, Bellflower, Cerritos and Artesia.